This mob spawns at +2766, +2366 inside the outpost. This page last modified 2018-08-04 23:32:54. Level 50 SK - Hailed Finlay and was offered "Mouth of the Dragon" Unlimited Skyfire Mountains. Solo. Quest window text: This isn't like any journey youv'e ever taken before. This time your on a serious mission to find the one they call Morticaldon. No one knows what it looks like or even if it really exists, but legend says a creature of sinister power roams the lands in search of prey once every hundred years. Its time the search started for this mythical creature and your the one who's going to be at the forefront. The search has already begun but there are plenty of places to search. You should explore the dragon mouth on the lava flow west of Veeshan's Peak, to start. Think you can handle that? Task updates at approx 2321 3816 -105 next to Enrid Ebonclaw and 4 Servants of Peak. Text in window after update: Don't worry about it too much, there are plenty of other places to explore, and there is no doubt in anyone's mind this creature is real but highly elusive. Why don't you take a torch and explore the Northeast Crater? That seems like the next best place to look for it. Task updates at approx 1760 -1716 -654 down in the crater. Text in widow after update: No luck there either but don't fret. 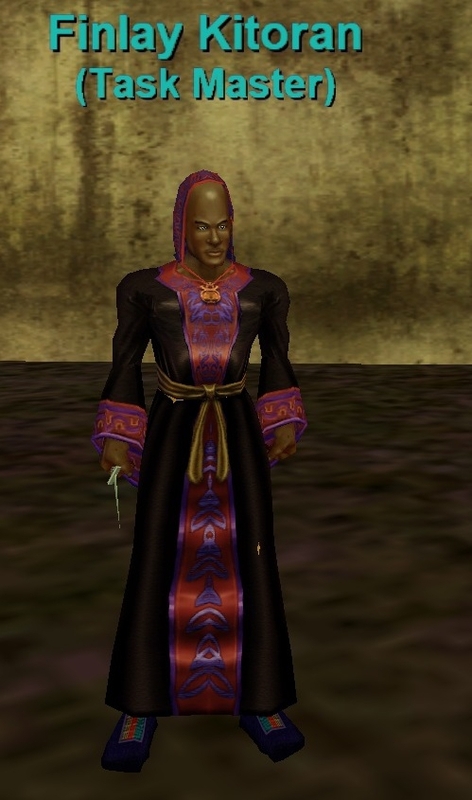 There will be plenty of chances to find the beast before your time in Norrath is done. Go find and speak to Khieka Ripclaw just to let them know you have begun to search. #3 Speak with Khieka Ripclaw - Click on Khieka and task updates with text: The search for Morticaldon won't end not as long as there are intrepid explorers like you are on the trail. With this type of creature you never know when or where you will find it but one thing is for sure - finding this creature will be the most rewarding experience you'll ever have. In the meantime here's payment for the time you spent searching. Received 35 plat 8 copper and 8 gold and small amount of experience. Is there a particular faction needed to get tasks from him? My Barb shaman can hail him and get the dialog, but when I respond "tasks" nothing happens. Pretty sure he's Venril Sathir, same as the rest of the outpost. My necro is amiable to him, as I am to the rest of the outpost. I sent in a level 5 Mage (Dark Elf) to buy the spell. He was apprehensive. Spell cost 69p 8g 5s. This guy gives out tasks - gave my 53 Beastlord a choice of 3. Loc is 2766, 2366, -50 in the OT outpost. He sold me a Fine Steel Warhammer and I didnt even buy it! So cheep! Glitch!